Best Season : September-November and March - May. Bhutan, the kingdom of thunder. Also believed to be the country of the last sangrila is one of most spectacular destination in the world. Bhutnese are the people, who follow the philosophy of gross national happiness. 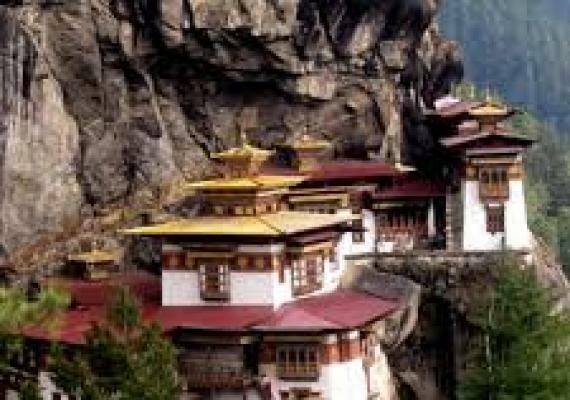 Bhutan is one of the most expensive destination in the world as tourist have to pay minimum tariff of US$250 per day. However, this fee includes accommodation, food, transportation and an official guide. The treasure house of the arts offers clean and peaceful environment which makes your travel heavenly. Day 1 : Day 01: Arrive at Paro Airport. The wondrous flight into the Himalaya offers you great view of different peaks including Mt Everest. After landing in Paro Airport, drive to Thimphu. The capital city of Bhutan. Kuenselcholing view point: Buddha view point gives you good overview of Thimphu valley. Taschichho Dzong: Taschichho Dzong was built in 1641. This fortress is a house of secretariat building, throne room and the king office. Drive to the edge of Tiger’s Nest and five hours hike to Taktsang Monastery. This monastery hold great cultural history of Bhutan. It is believed that in 8th century Guru Rimpoche meditated here. And visit farm house. Drive to paro. Night stay in paro. Departure day. Drive to Paro Airport for your forward flight.